Get rid of nature, the natural way….! Why don’t my neighbours lock their creatures or tie them to a stake in their own garden! A question I find myself asking lots of time when I again find poop in my yard… I mean poop from foxes, deers, rabbits and so on, no problem. But from dogs from neighbours, no way. They have to train them properly. But since they don’t do that and blame other neigbours you have to take matters into your own hands. 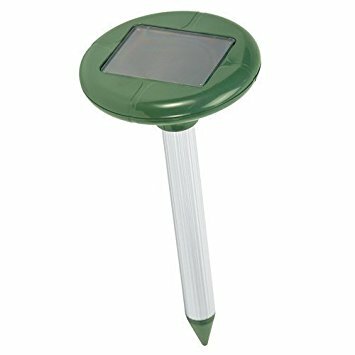 So you can think about a solar powered animal repellent. There are many different kinds of solar repellents on the market to get rid of unwanted dogs, cats or insects. Some of them for example produce an ultrahigh pitch sound that animals don’t like. Of course these sounds are inaudible to our ears 🙂 Here is an example of a mole repellent. 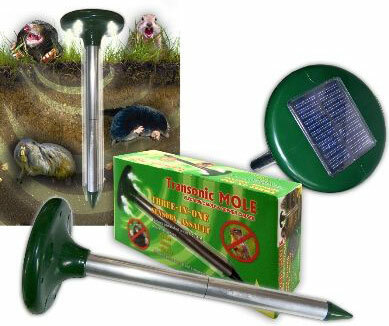 This ‘Transonic Mole TX-MOLE – Mole and Gopher Chaser Sensory Attack’ from the company bird-x produces vibration and sounds every 20 seconds to annoy those underground creatures. 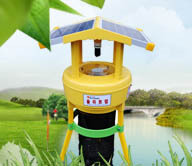 The Solar Trap makes use of a BLB lamp to lure mayflies, mosquitoes, moths and other pests, and then propels them by fan into an inescapable netting. Eminently suitable for agricultural settings as well as recreation areas such as golf course, gardens and parks. turns off when temperatures fall below 12 C.
You can buy a solar powered repeller at Amazon or eBay. Pest control is necessary, specially if you have a wooden home and if you are cultivating some plants.